Yes, you can buy healthy food on a budget! Now that organic foods have become big market, it means that the good stuff is rendering more affordable. As most of you know, I love eating whole, unprocessed foods – nutritious, green foods. But just like you, I don’t like paying high prices for mother nature’s good food. I am hear to tell you about 5 ways to save on organic food. With the Organic Food sector growing faster than ever, coupons for organic foods are becoming more common. To find the best coupons, check out some of your organic food makers websites for printable coupons. Organic Coupons & Deals has a whole list of companies offering coupons for organic products. Buy products in the bulk aisle like beans and rice. Not only are they more nutritious, they costs are significantly less than their processed counterparts. Just two weeks ago, I learned how easy it was to make refried beans (why did I wait so long?). The cost: $1.68 to feed 8 people. That would have been at least $6 if I bought the canned stuff! If you feel the need to shop at the more popular big natural and organic stores because they offers items that are not readily found in the average supermarket, at least try shopping at a store like Trader Joe’s. The marketing genius, has about eighty percent of their product sold under their company name. Even better, I discovered that many of Trader Joe’s private labeled products are made by some of the same expensive name brand manufactures (like Tasty Bites Indian Food). The dirty dozen are known as the fruits and vegetables most highly contaminated foods with pesticides and chemicals – even after washing and peeling. They are: celery, potato, imported grapes, cherries, apples, spinach, sweet bell peppers, strawberries, raspberries, pears, nectarines, and peaches. Buy organic versions of the foods on the list when possible. Compare the store’s ads to find current savings. Warehouse membership stores are now carrying a wider selection of organic products. These are items like organic ketchup, fruit snacks & vegetables, peanut butter and dairy. Organic foods are known to have a shorter shelf life than processed food. So, consider taking a friend to help you split costs, packages, and help you use the product within a proper time. This entry was posted in Finances and tagged organic food on 2010-09-17 by Christine. Next to winning with money, winning with food is another subject of passion in my life. My wife and I buy mostly organic, whole foods, yet were able to shrink our grocery budget. It’s not easy, but it is quite doable… we’ve been at it for nearly 2 years now. I encourage everyone to visit localharvest.org to find the farms in your area. 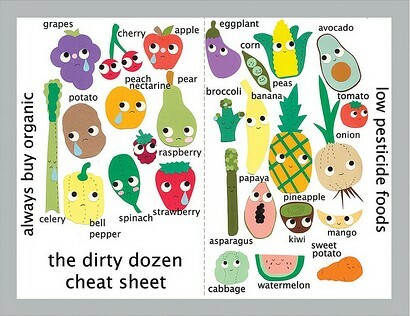 Thanks for the Dirty Dozen graphic – I printed it out and am forwarding to family members. Although buying organic is more costly, you can still be discriminating by monitoring what the “regular” price is for items at the store and then watching for specials. I visit my store of choice on a regular basis and know when a real deal is happening for the staples I stock up with. Good eating! You’re welcome. I thought that was a cute find. I think organic becomes expensive when you mix it in with buying processed items on your grocery list. Like if I buy bread while buying myself some organic bananas. I think if I had the time to cook everything, bake my own bread, thus buying just whole unprocessed food (kind of pioneer living) then it wouldn’t be so expensive. 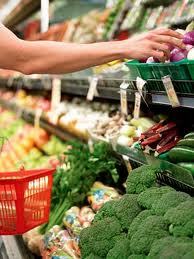 Plus popular grocery chains tend to price higher with organic foods then your healthy smaller chains. At least in my experience (Fresh & Easy vs. Albertsons). Thanks for sharing that dirty dozen list. I love visual graphics that quickly give an overview. I also love Trader Joes; I haven’t shopped their recently but now that you’ve reminded me, I need to schedule a grocery visit. Isn’t that cute? Would be nice to laminate it and pop it in the purse. I love TJs, too. Have fun shopping (we had to do the same trip this last weekend). Great Info! I’ve noticed when purchasing my families vegetables fresh instead of canned we have more servings, taste better and more filling. We usually make our own mixed vegetable dish with each of our meals. Thanks for sharing all tips for shopping organic food. This blog is very helpful ful me. I like to buy organic product but it is expensice for me. So, this blog can help me save money. That’s good!!!. After my mom passed away because of cancer. I’m very concern that food without chemical is the most important factor for us. You’re welcome. If you’re like me, eating organic foods makes sense to me. The costs normally associated with buying cuts of meat is instead paid towards organic veggies. I have a girl friend who was diagnosed with breast cancer. She is a big believer in juicing fruits and veggies now. I believe there is a big play towards food and health. Shop at your local farmer’s market or support your local CSA (community supported agriculture) group. Thank you for the tip. I thought about listing a CSA, but the one I was going to join wasn’t so cheap. However, I think if you go in with a group of people (like a Meetup group that takes place by my house) than it might be worth it. We split our “share” with another family in the neighborhood. Seems to work out well that way. When we first started looking at organic food, there were very few coupons available. Now, there seem to be a lot more. Also, not waisting the money on purchasing the organic variety on certain foods (like bananas) is also a great tip! Thanks for all of this great info! I’ve been shopping organic for awhile, but haven’t looked for coupons lately since there wasn’t any in the past. Thanks for the links for the coupons. Our neighbor has fresh eggs that we buy for 2.00 a dozen. My friends do CSA’s and do quite well. Awesome to know you are vegan! We are dairy free, and are trying to cut out most meat. I don’t want my 1 and 3 year olds without protein but they don’t like quinoa or beans! Any suggestions?